1 Add the onion and oil to a large saucepan. Cover and cook on medium-high heat, stirring occasionally until slightly brown. 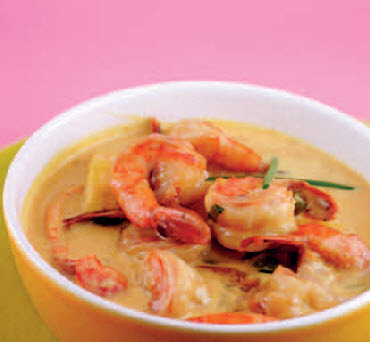 Add the remaining ingredients except the coconut milk and prawns or shrimp and cook over medium heat, stirring occasionally, about 5 to 7 minutes. 2 Pour in the coconut milk and bring the sauce to a boil, stirring. Add the prawns and simmer uncovered, stirring occasionally until just cooked through, 3 to 5 minutes. Serve hot.